Using a knife, remove the seeds, stems and any veins on the ancho chiles.eat a 10-12 inch cast iron skillet over medium heat and roast unpeeled garlic until soft and slightly browned about 5-7 minutes. Remove and set aside. Add the chiles to the skillet to soften turning after 1 minute. Peel the garlic cloves and add to the skillet. Add remaining Adobo ingredients and stir together.ring to a boil and then reduce heat to low. Cover and continue to cook for 20 minutes. Remove from heat and let cool. When cooled, remove bay leaves and cinnamon stick and puree in a blender or food processor until the Adobo sauce is smooth. Season both sides of bison shanks with kosher salt and pepper and let rest for 15 minutes. Heat cast iron skillet or heavy stock pot over medium-high heat and add canola oil. Working in batches, braise both sides of the bison shanks until golden brown. Place shanks in a large baking dish. Pour Adobo sauce over the Bison shanks. Cover dish with tinfoil and bake for 2.5-3 hours being sure to turn shanks every hour. When the meat falls off of the bone, remove shanks from oven and let cool. Once cooled, remove all meat and marrow from the shank and roughly chop on a large cutting board. Place chopped meat back into baking dish and stir any remaining sauce over meat. Soak corn husks in water for 30 minutes. Remove and drain. In a large bowl mix the masa, baking powder and salt together. Add water and mix with thoroughly with your hands. In a small pan over low heat slowly melt the lard so that it’s easier to work with. Pour slightly cooled lard into the masa and mix with your hands until smooth and slightly sticky. Spread masa thin and evenly over each corn husk and spoon Bison adobo filling in the center. Close the corn husk inward towards the center and fold the end up and over. Secure with kitchen twine. 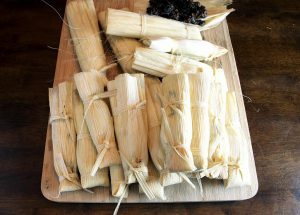 Put a couple of inches of water in a tall pot, place a steamer insert or pasta colander inside and then place tamales standing up. Cover and steam for 45 minutes to 1 hour. 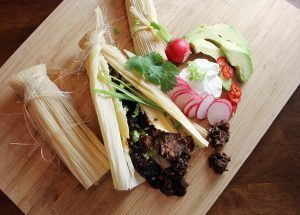 Garnish and serve with sliced radish, cilantro, green onion, sour cream and avocado!